Subtalar arthroscopy is increasing in popularity due to its less invasive nature with respect to open procedures and expanded indications. It may be used as a diagnostic or treatment procedure, or both. The surgery is performed through small incisions, by using a viewing instrument called an arthroscope. An arthroscope is a thin long tube with a camera attached, which helps your surgeon clearly view the surgical site on a monitor. The subtalar joint is a complex joint located below the ankle joint and is formed by the union of the heel (calcaneus) and the talus (ankle) bone. The subtalar joint allows side to side (inversion and eversion) movement of the foot. This joint can be injured with a sprain or fracture of the talus or calcaneus bones, causing pain and instability. Because arthroscopy is less-invasive and traumatic than traditional surgery, it reduces the risk of infection and swelling and allows for significantly speedier healing and recovery. 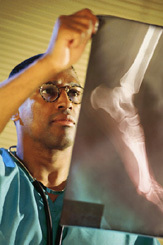 Most arthroscopic surgeries of the foot and ankle are performed on a same-day, outpatient basis. Very few surgeons offer this treatment option due to the complexity of the procedure. The surgeons at the Foot and Ankle C enter of Nebraska and Iowa are pioneers of subtalar arthroscopy and its emerging uses. The Foot and Ankle of Nebraska and Iowa's research on the use of subtalar arthroscopy have been published in the Journal of the American Podiatric Medical Association (JAPMA). You can also watch Drs. Robert Greenhagen and James Whelan discuss their research and the use of subtalar arthroscopy on a webinar for the American Society of Podiatric Surgeons. Click the ASPS logo to watch the webinar. If you would like to see a video on how subtalar stability is assessed during surgery, click the image below. For more information, call for a consultation with our podiatric surgeons call Foot and Ankle Center of Nebraska and Iowa today at 402-391-7575.